The Rose of Petrichoria series was inspired by my mother, who suffered from vascular dementia. At one point in her degeneration, she was forgetting actual parts of her history while creating new ones that never happened. How did I know this? My mother was a story-teller. For the entirety of my childhood, I heard her tell her life story over and over again to the point where my brother and I would kid around by saying something like, “Story 675” every time she would start telling a part of it. This was sad in and of itself, but that wasn’t the worst of it. The worst was when other people forgot her for one reason or another, and they had no excuse. When I wrote this series, I wanted to give people a look into what someone with a memory issue experiences. The disorientation of finding yourself somewhere and not knowing anyone around you. Thinking something happened when it never really did. How you feel when someone leaves you because they can’t handle seeing you that way or takes advantage of you because of your disability. I’ve had quite a few people comment that the first book was confusing in some parts. Good. That’s the whole point. “The transition of her waking up in the white room seemed a bit abrupt” is something I’ve heard a couple of times. It’s supposed to be abrupt. “She shouldn’t be so accepting and jump right into things like she did” is another. When you have a memory issue, you’re dependent on the people around you to show you the truth of your life and guide you through it. Miriam knows nothing about being royalty in the future, so she really has no choice but to trust Doctor Bartholomew and her parents. In the second book, she remembers her life, so things become more coherent. The prequel is meant to be read between the second and third books, so you can know her history at the same time she learns it. Finally, in the third book, Miriam gets a better ending than those who have dementia of some sort. For dementia patients, they slowly lose themselves until there’s no one left and they pass away, like my mother. This series is all about putting yourself into the shoes of some of the most vulnerable people in the world. The Faith in Concordia series is the first part of a larger series. Concordia is big, folks. There will be seven projects in total. So far, I have this series planned, then there will be Hope in Concordia, Love in Concordia, Joy in Concordia, Peace in Concordia, Unity in Concordia, and Justice in Concordia. Faith in Concordia is about the importance of trust. While it’s great to believe in yourself, it’s greater to believe in something bigger than yourself. To know that you have been gifted with talents and abilities, and it’s up to you how to use them. Will you benefit yourself or others? The other part of it is how it feels when no one believes in you. One of my personal faults is that I am in a constant state of fear of disappointing the ones I love. Of not measuring up to their expectations. At times of my life in the past, I was underestimated by a lot of people. That kind of behavior toward someone leaves a mark. Faith has lived a life ignored or tolerated by society at large. Eventually, she learns a skill that boosts her confidence and she has her own business, but she has been moved around so much, she is afraid to get attached to people. When she discovers she has a living family, even if it is completely bizarre, she wants to believe things will work out for her. However, she finds out things about the world of Concordia that bring her back into her shell, especially when other people she barely knows have complete control over her life. This series is all about Faith learning to trust others and dealing with the fact that she may have to prove herself to her new world before they will trust her. Hope in Concordia will be about a character we met in the Faith in Concordia series, Snowdrop. Her whole life, she has been mocked or shunned because of her exterior appearance and the mystery of her future magic, or if she will ever have magic at all. Solan, the brother of the Lord of Summer, and current scion of his court, has led the way in her persecution due to his bitterness with his brother for holding out on arranging a bonding contract for him because Lord Chaudin wants to wait to see how or if Snowdrop will Transition. This all changes when the new High King Uriah abolishes forced contracts on females and gives them the autonomy to accept or reject proposals by males. Now that the responsibility to bond falls onto the shoulder of the sons and daughters of Concordia, rather than their parents, males are starting to actually pay attention to the blossoming Snowdrop. The final year of schooling for Snowdrop and her peers will take place in the Winter Court, home to Jack, the second son of Winter, who has decided she is worth the time to pursue. In the last part of Winter, Snowdrop is due to Transition. Will she? If she does not, how will that affect her future? If she does, what will her magic be like? Who will succeed in capturing her heart? One of the most frequently asked questions I get when I’m at events is, “What is the age range for these books?” Rose of Petrichoria and Faith in Concordia are aimed at young adults and teens, so I always tell them, “Thirteen, at the youngest because of some content.” Then, the child looks downtrodden and my heart hurts for them a bit. I understand their plight. Not only was I the same way as a child, but my own daughter has a higher reading level than her peers. It’s hard to find a book that she will be interested in that will also challenge her as a reader. Never fear! One of my current projects is Mary’s Memoirs, a series about a ten-year-old mermaid from Aquantis, the underwater empire in Concordia. Mary is a smart girl who has some difficulties making friends because of her quirkiness. 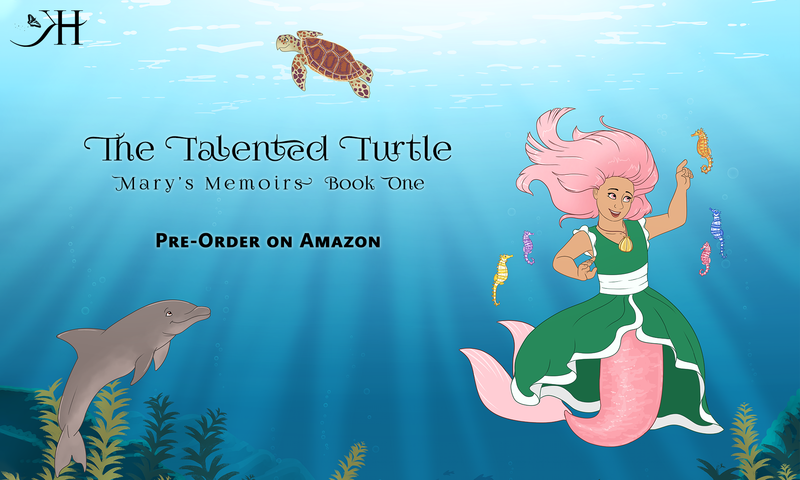 In these books, the reader will get Mary’s point-of-view as she goes through her schooling and explores the Torrid Sea province of Aquantis. This will allow for kids to enjoy the world of Concordia with their parents, who may be reading the grown-up books, and get them excited for the day they can read the stories Mom or Dad love, too. I am also very pleased to be partnering with Kris Lewis, who will be drawing the cover art for the books in this series.